I'm continuing to review the links that the Winegard brothers provided in their defense of "The Bell Curve" in Quillette. I've reviewed the first five here. The Winegard bros maintained that the theory that some "races" are dumber than others is especially plausible because "there are, as yet, no good alternative explanations." Upon first encountering evidence of an IQ gap between Blacks and Whites, many immediately point to socioeconomic disparities. But researchers have long known that socioeconomic status cannot explain all of the intelligence gap. They provide a link to an article from 2009 in the Huffington Post by Dan Agin Emeritus Associate Professor of Molecular Genetics and Cell Biology, who devotes one paragraph to the cultural bias issue. And they don't address his argument at all, they just move on. Standardized tests of cognitive abilities are grounded in the psychometric approach to intelligence, which has focused on understanding individuals’ ability to reason, plan, solve prob- lems, think abstractly, learn and adapt, and process and com- prehend complex ideas and information (Ones, Visweswaran, & Dilchert, 2005). This does not mean that cognitive tests are pure measures of individuals’ innate ability. Although highly stable over the course of decades (e.g., Deary, Whalley, Lemmon, Crawford, & Starr, 2000), test scores reflect developed abilities and are a function of innate talent, learned knowledge and skills, and environmental factors that influence knowledge and skill acquisition, such as prior educational opportunities. One could raise a legitimate societal concern that there are differential opportunities to learn swimming, as well as familial, social, environmental, peer, economic, and cultural factors that contribute to the difference. Indeed research has found support for some of these factors (Mael, 1995). However, this is not bias in the measure. The key points are that the swimming test is not the source of the difference and is a measuring a legitimate skill and a predictor of subsequent performance. We want life guards who can swim well. Addressing the skill disparity is a societal issue. Condemning the swimming test will not correct the societal issue any more than discarding a thermometer will make a fever go away. In other words, skill disparity caused by social conditions is not their problem. Again they provide a link to a single source, in this case a book by Richard E. Nisbett called Intelligence and How to Get It: Why Schools and Cultures Count and they don't address any of his arguments. They just declare it a failure and move on. But what they say prior to that is truly jaw-dropping. The idea that "a legacy of slavery/discrimination" has no impact on black intelligence is an example of the primary problem with evolutionary psychology: its extreme resistance to acknowledging socio-economic factors. Buss cites several studies like this as indicating that "high status in men leads directly to increased sexual access to a larger number of women," and he implies that this is due to the greater desirability of high-status men (David Buss 1999 "Evolutionary Psychology the New Science of the Mind"). But, among the Turkmen, women were sold by their families into marriage. The reason that higher-status males enjoyed greater reproductive success among the Turkmen is that they were able to buy wives earlier and more often than lower-status males. Other studies that clearly demonstrate a reproductive advantage for high-status males are also studies of societies or circumstances in which males "traded" in women. This isn't evidence that high-status males enjoy greater reproductive success because women find them more desirable. Indeed, it isn't evidence of female preference at all, just as the fact that many harem-holding despots produced remarkable numbers of offspring is no evidence of their desirability to women. It is only evidence that when men have power they will use it to promote their reproductive success, among other things (and that women, under such circumstances, will prefer entering a harem to suffering the dire consequences of refusal). You can build a case for "the legacy of slavery/discrimination" having an impact on intelligence in five minutes if you possess deductive reasoning ability and have access to the Internet. Does poverty have an impact on intelligence? Yes. Have black people in general been poor since the days of slavery? Yes. Abstract: We investigate the effect of slavery on the current level of income inequality across US counties. We find that a larger proportion of slaves over population in 1860 persistently increases inequality, and in particular inequality across races. We also show that a crucial channel of transmission from slavery to racial inequality is human capital accumulation, i.e., current inequality is primarily influenced by slavery through the unequal educational attainment of blacks and whites. Finally, we provide suggestive evidence that the underlying links run through the political exclusion of former slaves and the resulting negative influence on the local provision of education. So there you have it - black people have been poorer than whites since the days of slavery and not only does the legacy of slavery impact the acquisition of wealth by blacks, an important cause is unequal education attainment. Poor education leading to poverty and the stresses of poverty itself combine to provide a compelling case that blacks having lower intelligence scores than whites is not genetic. I wasn't aware of either of the two studies I mentioned until I sat down to write this post. I made a tiny effort to look. The Winegard brothers didn't find any compelling cases because they didn't bother to look. Here is Steven Pinker on Twitter, in reference to the Winegard article, claiming he doesn't agree with The Bell Curve on race. 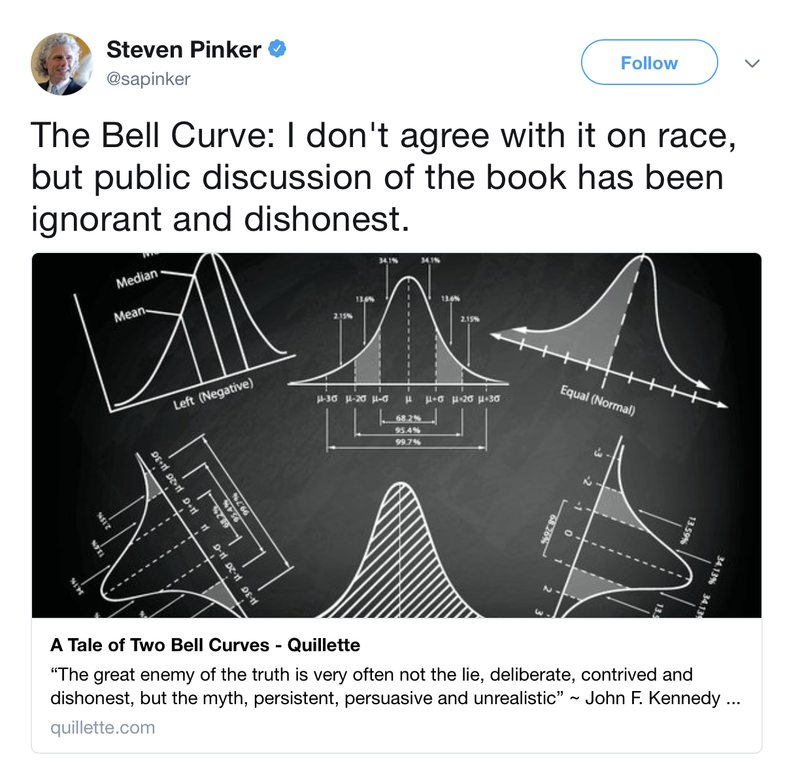 But if Pinker doesn't agree with the Bell Curve on race, and given that the "public discussion" of the book has focused on criticisms of what it says about race, and given that he maintains the discussion has been "ignorant and dishonest" then what exactly is it about race in The Bell Curve that Pinker doesn't agree with? More on the links in this Bell Curve article in the next post.